We carry a rainbow of colors, a shade for every project. 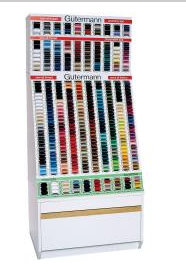 We have 254 shades in the 100m spool. We will be uploading a shade card, but in the mean time, you can tell us to match a fabric you are ordering and we will choose the best match for you, you can specify a color or if you have a spool you have used up just reference the color number.